Revelers at this year's Coachella Valley Music and Arts Festival will be able to pay for food, drinks, merchandise and more with their iPhone and Apple Watch thanks to a partnership with Square, which is supplying on-site vendors with Apple Pay-compatible mobile card readers. 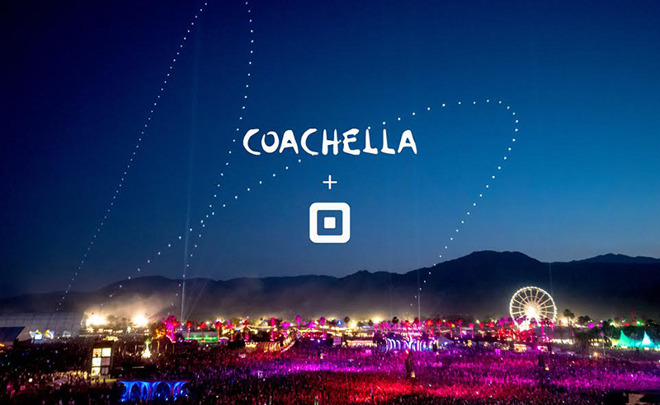 Square, Coachella's official point of sale provider, is bringing its new Contactless and Chip Reader payment device to the festival, meaning iPhone and Apple Watch owners with compatible hardware can leave their wallets at home. With support for Apple Pay, Android Pay and EMV, the new Square Readers offer a safe, convenient alternative to cash, though all forms of payment will be accepted at next week's festivities. Square teased the Apple Pay-compatible product at Apple's Worldwide Developers Conference last year before its public release in November. Apple itself began stocking the $49 device at its retail stores in February. Organizers note Coachella is the first festival to integrate an open-loop payments network which is not only faster than closed-loop networks, but supports a wide variety of payment options well suited to touchless mobile solutions like Apple Pay. Coachella is further obviating the need for physical wallets by building iBeacon support into its official iOS app. The festival first adopted Apple's proximity-aware iBeacon technology in 2014 to send out location-based push notifications and other information to iPhone users. This year, iBeacon transmitters will be used to dish out "Surprise and Delight" rewards to attendees who link their AmericanExpress card with the official Coachella app. Based on where they are on festival grounds, attendees can win a handful of prizes, which will be revealed in the near future. Coachella 2016 is a two-weekend affair that kicks off on April 15 at the Empire Polo Club in Indio, Calif.